You made your rulers mighty, gave them guards, so now you groan 'neath slavery's heavy rod. I grow old ever learning many things. 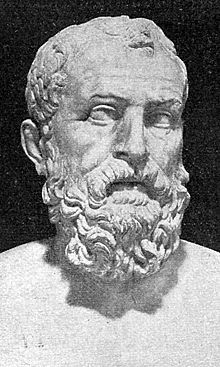 Solon (c. 638 BC – c. 558 BC) was an Athenian statesman, lawgiver and poet. He is numbered among the Seven Sages of Greece. Do not counsel what is most pleasant, but what is best. Herodotus (trans. Robin Waterfield) The Histories Bk. 1, ch. 32, pp. 15-16. Diogenes Laërtius (trans. C. D. Yonge) The Lives and Opinions of Eminent Philosophers (1853), "Solon", sect. 5, p. 25. Consider your honour, as a gentleman, of more weight than an oath. Diogenes Laërtius (trans. C. D. Yonge) The Lives and Opinions of Eminent Philosophers (1853), "Solon", sect. 12, p. 29. The feigned good wishes of his wary mind. Diogenes Laërtius (trans. C. D. Yonge) The Lives and Opinions of Eminent Philosophers (1853), "Solon", sect. 13, p. 29. Justice, even if slow, is sure. While riches change their owners every day. That city in which those who are not wronged, no less than those who are wronged, exert themselves to punish the wrongdoers. Having been asked what city was best to live in. Variant translation: As I grow older, I constantly learn more. Men keep their agreements when it is an advantage to both parties not to break them; and I shall so frame my laws that it will be evident to the Athenians that it will be for their interest to observe them. Reported in George Shelley Hughs, Ancient Civilizations (1896), p. 596. From... universal degradation the world was rescued by the most gifted of the nations. Athens, which like other cities was distracted and oppressed by a privileged class, avoided violence and appointed Solon to revise its laws. It was the happiest choice that history records. Solon was not only the wisest man to be found in Athens, but the most profound political genius of antiquity; and the easy, bloodless, and pacific revolution by which he accomplished the deliverance of his country was the first step in a career which our age glories in pursuing, and instituted a power which has done more than anything, except revealed religion, for the regeneration of society. The upper class had possessed the right of making and administering the laws, and he left them in possession, only transferring to wealth what had been the privilege of birth. To the rich who alone had the means of sustaining the burden of public service in taxation and war, Solon gave a share of power proportioned to the demands made on their resources. The poorest classes were exempt from direct taxes, but were excluded from office. Solon gave them a voice in electing magistrates from the classes above them, and the right of calling them to account. This concession... was the beginning of a mighty change. It introduced the idea that a man ought to have a voice in selecting those to whose rectitude and wisdom he is compelled to trust his fortune, his family, and his life. And this idea completely inverted the notion of human authority, for it inaugurated the reign of moral influence... Government by consent superseded government by compulsion, and the pyramid which had stood on a point was made to stand upon its base. By making every citizen the guardian of his own interest Solon admitted the element of Democracy into the State. 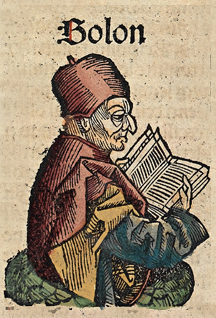 Solon's way of living was expensive and profuse and if in his poems, he speaks of pleasure with more freedom than becomes a philosopher, this is thought to be due to his mercantile life; he encountered many and great dangers, and sought his reward therefor in sundry luxuries and enjoyments.